Hugo 0.36: Smart Image Cropping! 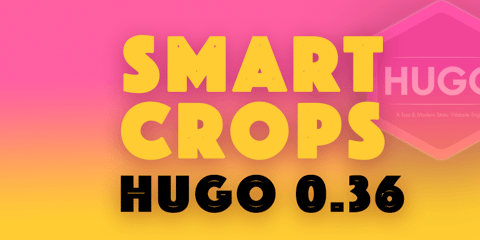 Hugo 0.36 announces smart image cropping and some important bug fixes. Go to Hugo Releases for the release downloads. Hugo 0.36 announces smart cropping of images, using the library created by muesli. We will work with him to improve this even more in the future, but this is now the default used when cropping images in Hugo. Go here for a list of examples. This release represents 7 contributions by 3 contributors to the main Hugo code base. Many have also been busy writing and fixing the documentation in hugoDocs, which has received 9 contributions by 4 contributors. A special thanks to @bep, @Jibec, @Nick-Rivera, and @kaushalmodi for their work on the documentation site. Hugo now defaults to smart crop when cropping images, if you don’t specify it when calling .Fill. Also, we have removed the superflous anchor name from the processed filenames that does not use this anchor, so it can be wise to run hugo --gc once to remove unused images.